For the first time, a National University of Singapore (NUS) research group has developed an innovative water-based air-conditioning system with the ability to cool down to nearly 18 °C without the need for using energy-intensive compressors and environmentally hazardous chemical refrigerants. This path-breaking system can be a prospective substitute for the age-old air-cooling concept that is hitherto being used in our present-day air-conditioners. The innovative system is suitable to be used indoors and outdoors, is portable and can also be tailor-made for all weather conditions. The team was headed by Ernest Chua, an Associate Professor from the Department of Mechanical Engineering at NUS Faculty of Engineering. Their innovative air-conditioning system is cost-efficient to manufacture and is also more environmentally-friendly and sustainable. When compared to prevalent compressor-based air-conditioners used in commercial buildings and homes, the system reduces the consumption of electricity by 40%. This is equivalent to a greater than 40% decrease in the emission of carbon. Moreover, it is based on a water-based cooling technique rather than the usage of chemical refrigerants (e.g. chlorofluorocarbon and hydrochlorofluorocarbon) for cooling, thereby rendering it safe and more eco-friendly. As an added benefit tied to its environment-friendliness, the innovative system has the ability to produce potable drinking water while cooling ambient air. For buildings located in the tropics, more than 40 per cent of the building’s energy consumption is attributed to air-conditioning. We expect this rate to increase dramatically, adding an extra punch to global warming. First invented by Willis Carrier in 1902, vapour compression air-conditioning is the most widely used air-conditioning technology today. This approach is very energy-intensive and environmentally harmful. In contrast, our novel membrane and water-based cooling technology is very eco-friendly—it can provide cool and dry air without using a compressor and chemical refrigerants. This is a new starting point for the next generation of air-conditioners, and our technology has immense potential to disrupt how air-conditioning has traditionally been provided. Prevalent air-conditioning systems necessitate the use of enormous energy to dehumidify and to cool the air. The NUS Engineering team developed two separate systems to separately carry out these two processes, and could better regulate each process and hence accomplish more energy efficiency. The innovative air-conditioning system initially adopts an innovative membrane technique, using a paper-like material, to eliminate the moisture from humid outdoor air. The dehumidified air is then cooled by means of a dew-point cooling system that uses water as the cooling medium in the place of harmful chemical refrigerants. In contrast to vapor compression air-conditioners, the innovative system does not liberate hot air into the environment. Rather, it discharges a cool air stream that is relatively less humid than ambient humidity, thereby nullifying the impact of micro-climate. Nearly 12-15 L of potable drinking water can also be produced at the end of 24-hour functioning of the air-conditioning system. Our cooling technology can be easily tailored for all types of weather conditions, from humid climate in the tropics to arid climate in the deserts. While it can be used for indoor living and commercial spaces, it can also be easily scaled up to provide air-conditioning for clusters of buildings in an energy-efficient manner. This novel technology is also highly suitable for confined spaces such as bomb shelters or bunkers, where removing moisture from the air is critical for human comfort, as well as for sustainable operation of delicate equipment in areas such as field hospitals, armoured personnel carriers, and operation decks of navy ships as well as aircrafts. 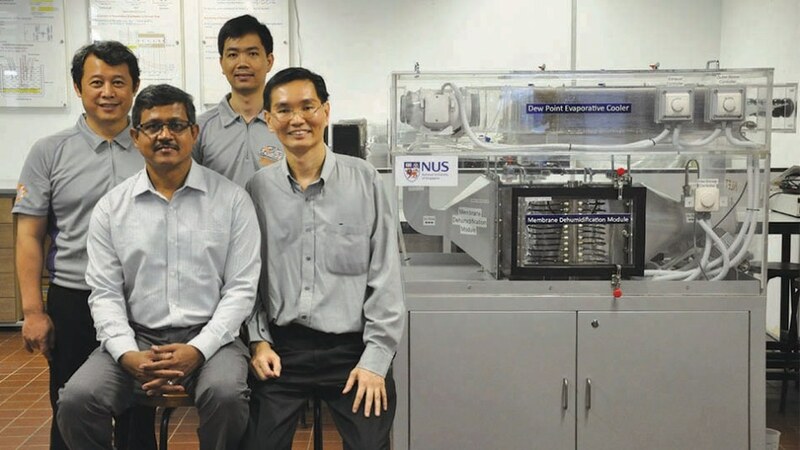 At present, the NUS researchers have been working to improve the air-conditioning system’s design to further enhance its user-friendly aspect. They are also striving to include smart features such as real-time tracking of energy efficiency and pre-programmed thermal settings depending upon the presence of humans. The researchers are confident that they can get to collaborate with industry partners to achieve commercialization of the technology. The Building and Construction Authority and National Research Foundation Singapore supported the study.